Hello VFC Owners! Can you believe it’s time to start talking elections again? This has been an incredibly busy and successful year for the Co-op. I speak for the Board of Directors when I say we are so very proud of the dedicated work that has been done to get us to where we are. People are taking note of what we’ve done here, and it’s all because of the exceptional leadership and teamwork that is in practice every single day at the VFC. Our new and expanded store is here! Thank you for sticking with us through this major project. A big thank you to our investors, owner-members, and community who made this project a possibility. Thank you for your patience while our deli was put on hold for several months, and recalibrating when our entrance changed locations on any given week during construction. "The equity of a co-op comes from its membership and serves multiple benefits... Building our equity is an important part of our balance sheet and long term financial health." Due to my work at CROPP Cooperative (aka Organic Valley), and my longtime work with and dedication to retail cooperatives for my sustenance and community, I am constantly thinking about how we can build and grow a “cooperative movement.” What does that even mean, how are co-ops manifesting themselves today, and what can we do to encourage more? As we near the end of the huge undertaking of our co-op expansion, many thanks are needed. Thanks to the owners and shoppers who have supported us during the major shifts, both within and outside our co-op. Thanks to the employees who have worked diligently in moving stock, again and again, to accommodate the contractors’ efforts – and kept smiling during challenging times. Thanks to the management for tirelessly dealing with the myriad of details and long hours to bring this project to completion. Thanks to the investors who allowed our co-op the ability to afford such a formidable investment in our local food system. And thanks for having faith that our shared future is bright here in our community. After the last nail is hammered and the last bit of dust is swept away, we are hosting a Grand Reopening Celebration. The celebration begins at noon on Thursday, November 8th, with a Ribbon Cutting Ceremony outside the entrance. The fun and fantastic savings carry on through Saturday, November 10 – with exciting giveaways, lots of free samples, cooking demos, flash sales, live music, kids activities, and more! Please join us to celebrate this major step in our shared history. I’m so thrilled to share some highlights from my first year on the Board with you. Hello, fellow VFC Owners! As you can see, the expansion is in full swing. Isn’t it exciting to see the size and shape of our future Co-op? There is a lot more construction ahead and your patience is appreciated. Believe me, it will be worth it. 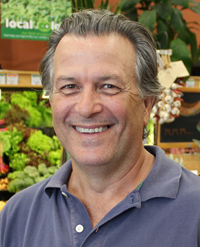 Over twenty years ago, I joined my first food co-op, the Olympia Food Co-op in Olympia Washington, because I believed passionately in the cooperative mission and supporting the local and organic food movements. Eleven years ago I was happy to have the opportunity to continue supporting the cooperative movement by becoming a member of the Viroqua Food Co+op when I moved to the area with my family. We knew if a small town could support such an incredible co-op it must be a special place. Indeed it is! And a little over one year ago, I decided to throw my hat into the ring, run for the Board of Directors, and be in a position of providing leadership, vision, and guidance for our Cooperative. Harvest time is beginning! It is the best time of the year for many of us – a time to enjoy the bounty of the land (and some hard work) gives us. Check out this issue of the Pea Soup for some great fall foods featuring cool weather favorites such as apples, squash and fermented veggies. The Board has been busy planning Viroqua Food Co+op's store expansion. The building plans are progressing and soon get submitted to the City of Viroqua for the appropriate permits. As I write this, the start of construction is a matter of weeks away. For those of you with questions concerning this process, please go to the expansion news tab on our website for updates and answers to frequently asked questions. We also have expansion information at the Owner Services desk near the front of our store. It has been an honor to serve the members of the VFC. After a year on the Board of Directors, I have come to appreciate the everyday hard work of the staff and General Manager. We have come a long way from the little store I remember shopping in as a child with my parents, but we do have further yet to go. The Board of Directors meet ten times each year. Board meetings are generally held the 3rd Wednesday each month at 6:30pm at an offsite location. Any changes are posted here on our website.